Gas & Electric Patio Heaters and Everything Outdoors! How much does it cost to run a patio heater? How Much Gas Does a Patio Heater Use? In the sizzling heat what better way is there to enjoy your garden space than dipping your toes in a paddling pool or taking a lap around an above ground pool before retiring to your Daybed. Although summer isn’t here yet, the best deals are! 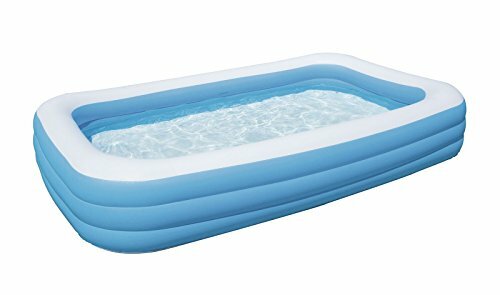 Prices on paddling pools plummet during winter (although that February heat wave almost convinced me to get mine out for the kids). Not all pools are built alike and if you’re looking for something a bit more special you’ve come to the right place. PatioMate has been hunting out the best deals for dipping, paddling and swimming to bring you the best the market has to offer. We’ll start with the bestsellers available via Amazon and then our favourite picks beneath! Make sure you’ve got your tap adaptor as well. 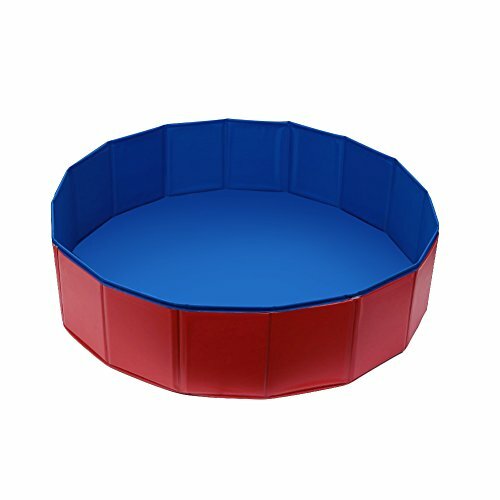 Here are the current best selling paddling pools in the UK. Perfect to help you beat the heat and stay cool during the hotter months. This little delight has hundreds of fantastic reviews from pleased parents. 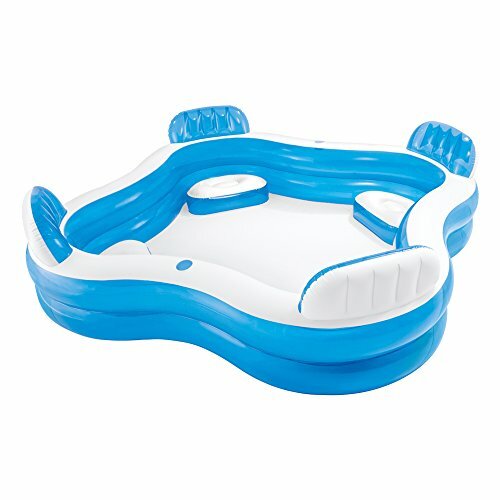 Designed for babies and toddlers aged 1-3 years, this pool is sure to bring hours of fun to your family time this summer. The duel purpose of being a ball pool means it can be enjoyed indoors and out all year round. Its small size is great if you’re short on space and is almost guaranteed to cause giggles. 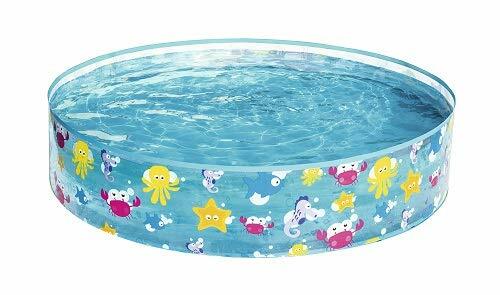 The pool is 124cm x 109cm x 71cm, which is ample for little toes. The built in sunshade is designed to help protect children from harmful UV rays but we at PatioMate recommend using sun cream, hats and avoiding the midday sun to keep your little ones safe and happy during the roaring heat. Installation usually takes approximately 10 minutes with 2-3 people excluding earthworks and filling. This Jr pool is perfect for the kids this summer. 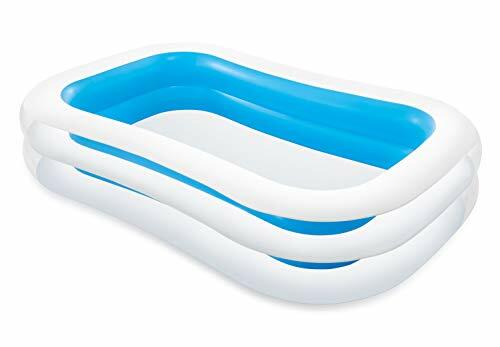 At 221cm x 150cm x 43cm there is plenty of space for a birthday pool party out in the garden. Setting up and filling this pool is described as fast and simple by users so it is ideal if you’re short on time before your guests arrive. 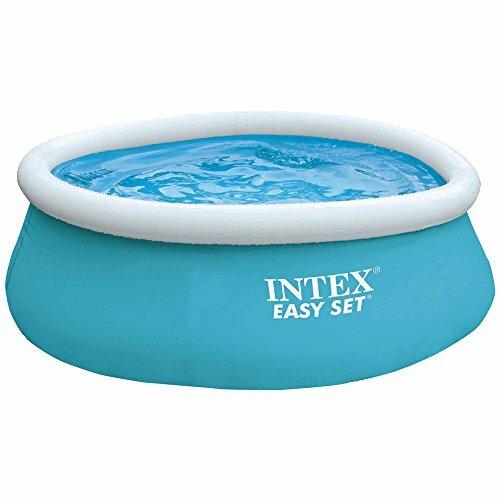 Equally this pool would make a fabulous gift for large breed dogs who love a good paddle. The battle seems well and truly on between the two top pool manufacturers this season, with the Intex Frame Pool just taking the lead by offering a deeper alternative to Bestways Jr pool. 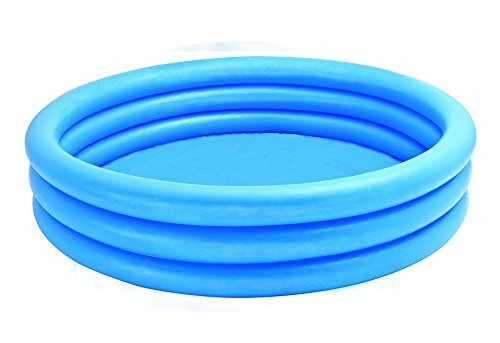 With fantastic reviews this pool is suitable for adults and children alike and the extra 17cm goes a long way in ensuring your inflatables remain inside the pool. 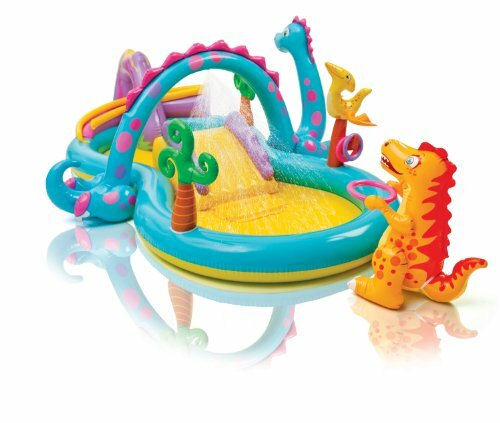 Designed for children ages 1-3 to create a fun water play environment the Intex Smiley Giraffe Baby Paddling Pool is great if you’re looking to paddle and play. Stimulating colours and including two inflatable rings and two dangling noise makers this toy is fantastic for engaging a young childs imaginative play. This pool comes at an incredible price and with all the careful details that have gone into creating it this is definitely amazing value for money. At an incredible10 feet in diameter and 30 inches deep this goliath pool is great for a large party or family reunion, or if you just want more space to swim solo this is the pool for you. 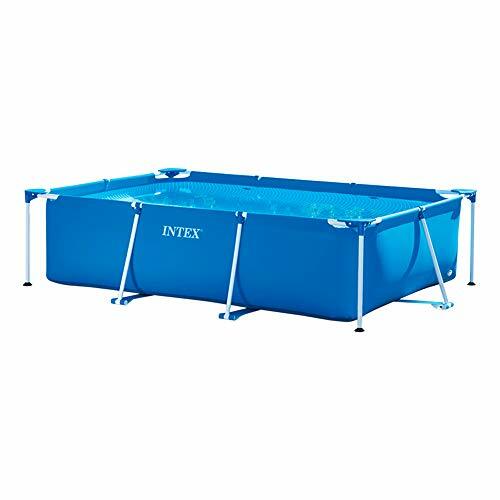 With a sturdy steel frame and a useful filtration pump included Bestway have pulled out all the stops to enable everyone to enjoy swimming at their own leisure. Mesh netting for ball hoop and six Fun Ballz included. Removable sun shade and Dolphin sprayer. 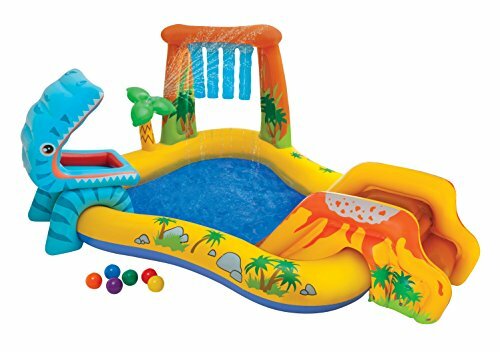 The Intex Summer Lovin’ Beach Play Pool is great if you’ve got little adventurers at home, this pool inspires creative play with it’s many features. At a rather impressive 170cm x 150cm x 81cm this pool has been designed to keep the squabbles at bay. A mesh netted ball hoop and six Fun Ballz are included as well as a removable sunshade and dolphin sprayer. This pool is for ages 2+ but with all the entertainment it offers we think parents would find it hard not to want a turn themselves. Land Ahoy! You’ll forget you’re at home in this gargantuan 18ft x 9ft above ground pool. There is ample space for inflatables, family, kids, pets and possibly a small dinghy or three. 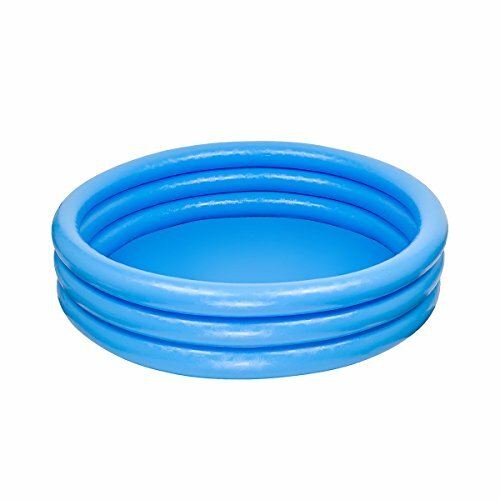 With impressive Tri-Tech material offering superior strength and durability, as well as withstanding exposure to ultraviolet rays and able to hold a mighty water volume this pool is built to last. It comes with a handy set-up DVD to avoid wasting any precious daylight hours. The pool comes with everything you need to get going, pump, filter, ladder, ground cloth and pool cover. Bestway Splash Frame Pool in Shade, with a Sun Canopy and Sprinkler 244 x 51 - Orange. The Bestway Splash Frame Pool with sun canopy and built in sprinkler is a fantastic pool, centred around family fun. Set up is simple and the rust resistant steel frame is sure to endure the test of time. 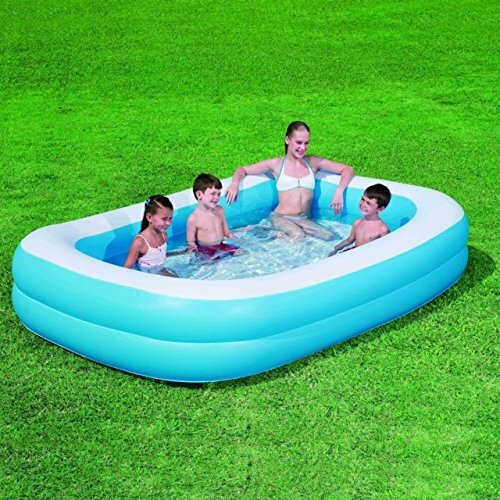 At 244cm in diameter this pool is comfortable for a family to play together in, while the UV resistant canopy protects sensitive skin from harmful rays. 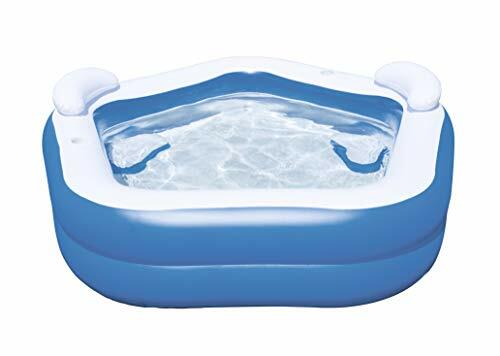 Designed with children at the heart of their interests Bestway have delivered a fantastic pool sure to be a firm favourite for adults and children alike. Luxury meets functionality for this fabulous reinforced rattan 14ft swimming pool. The Bestway 14ft Rattan Frame Pool would certainly look the part if combined with our 9 Seat Rattan Furniture Set and our Firefly Rattan Table Top Heater. It comes with everything you need to get started including pump, pool cover, ground cloth and ladder. The pool is made from the superior Tri-Tech material ensuring strength and durability even with thousands of litres of water inside and has been cleverly printed to look just like rattan. This highly desirable pool is sure to become a talking point at BBQ’s and garden parties. 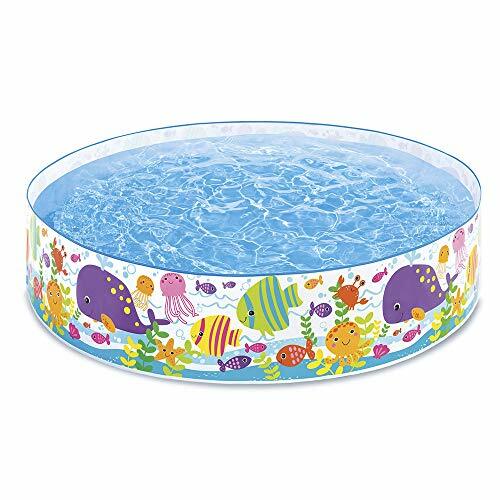 Don’t be fooled by the name, many users are purchasing this bargain pool with no intention of filling it with little people. With 4 integrated seats and 2 built in cupholders this pool is perfect for any family parties, friend gatherings or simply for you to relax in at leisure. At an impressive 229cm x 229cm x 66 cm, this pool is incredible value for money. There is space enough for several fully grown adults or mum, dad and all the kids. For price, design and functionality this is PatioMates number one pool this summer. Welcome to PatioMate, we're here to provide you with honest reviews, deals and discounts on your next patio heater or anything for the garden! Why not check out our garden and outdoors section for trampolines, bouncy castles and so much more. We compare prices across multiple vendors and you can sign up for free price alerts to let you know when a price has dropped! Our reviews are impartial and you can submit your own comments too! We do participate in multiple affiliate programs and earn commission on each sale made via this site - You can read our Amazon Affiliate Disclaimer here.